The re-opened Brandenburg Gate proudly bestrides the Unter den Linden, symbolic of a reunited germany whose capital Berlin is once more. Music and Art have always played a major part in the life of Berlin and we can visit the Staatsoper, the Komische Oper and the Deutsche Oper. There is time to visit the Dahlem Museum complex with its old master paintings from Duccio to Rembrandt, sculpture, Islamic and Indian exhibits and a wealth of gold from El Dorado. Also the Pergamon Museum with its Antiquities, the Breda Gallery of Old Masters, the baroque Charlottenburg Palace and Museum which contains the portrait bust of Nefertiti and many Byzantine treasures. Perhaps take an excursion to Potsdam to visit the delightful baroque Sans Souci Palace of Frederick the Great. In the heart of bustling Berlin, close to the Kurfurstendamm, warmth and the comfort of a small luxury palace, timeless elegance and individual touches make this a most tranquil oasis and charming a place to stay. The Wintergarten with its French cuisine, ranks amongst the prime fine dining in the city. A rich heritage of magnificence, excellent hospitality and sheer luxury. 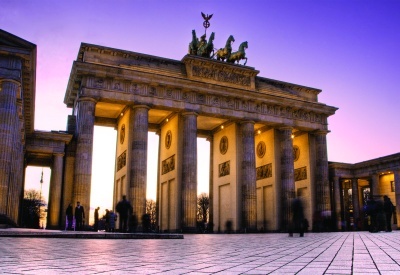 Located in the 'Mitte' quarter near the Unter den Linden and Brandenburg Gate, Reichstag, Potsdamer Platz and the Pergamon Museum. The grand historic building has spacious rooms with garden and city views, modern facilities including air-conditioning, hairdryer and satellite TV. Sauna, Solarium and fitness centre. Situated in the centre of Berlin within five minutes’ walk of the Staatsoper, the hotel is famous for a high standard of service and its restaurant serving light meals in a typical Berlin-Brandenburg style. Modern hotel in the city centre, conveniently located for all sightseeing and completely recently renovated all rooms are equipped with modern facilities including mini-bar, hairdryer and telephone. Centrally located close to the Brandenburg Gate.